Crescendo Music Therapy supports families and caregivers in their caregiving responsibilities! Whether your loved one is at home or in a facility, our board-certified music therapists will come to them, providing individual or family music therapy sessions, targeting specific therapeutic goals. Family is welcome to join in the session, or use that time to take a caregiving break! Personalized music makes a difference! It decreases agitation, increases relaxation, improves mood and engages the mind! We can provide individualized playlists or CD’s for your loved one, along with training on how to make the most of music when using it to target specific challenges. CLICK HERE to see more of the research supporting this activity. 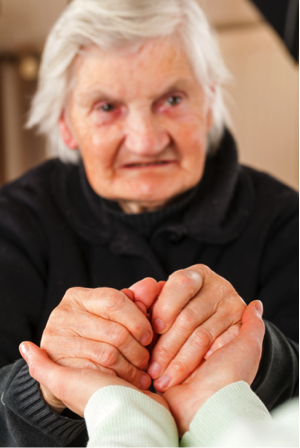 Often, communication becomes difficult, especially when dementia or strokes take their toll. Many families enjoy family music therapy sessions. It’s a way to interact and communicate that requires no words or memory. 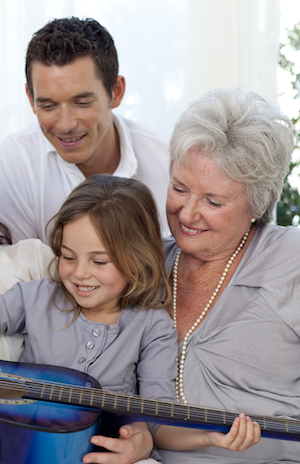 Grandchildren enjoy music-making with a grandparent. The troubles of old age are sometimes frightening to children, and music therapy offers them a way to build relationships and memories in a non-threatening environment. Adults enjoy family music therapy as well. They enjoy seeing their loved one’s improved responses to music, and the unity, fun and memories shared bring a brightness into life. Stress relief, relaxation, creativity, emotional expression… our music therapists can provide care for caregivers as well. Let us help “fill the cup” through music therapy sessions targeting the needs of caregivers. CLICK HERE to see research on caregivers and music. We’d love to visit with you!